written by Dr. Kanzan in November 1965. This sword belongs to ranking. Habaki : Solid gold double Habaki. 51grams. Blade length :　71.4　cm or 28.11 inches. Width at the hamachi : 3.15 cm or 1.24 inches. Width at the Kissaki : 2.31 cm or 0.90 inches. Kasane : 0.81 cm or 0.31 inches. Era : Edo period around Kanbun era. 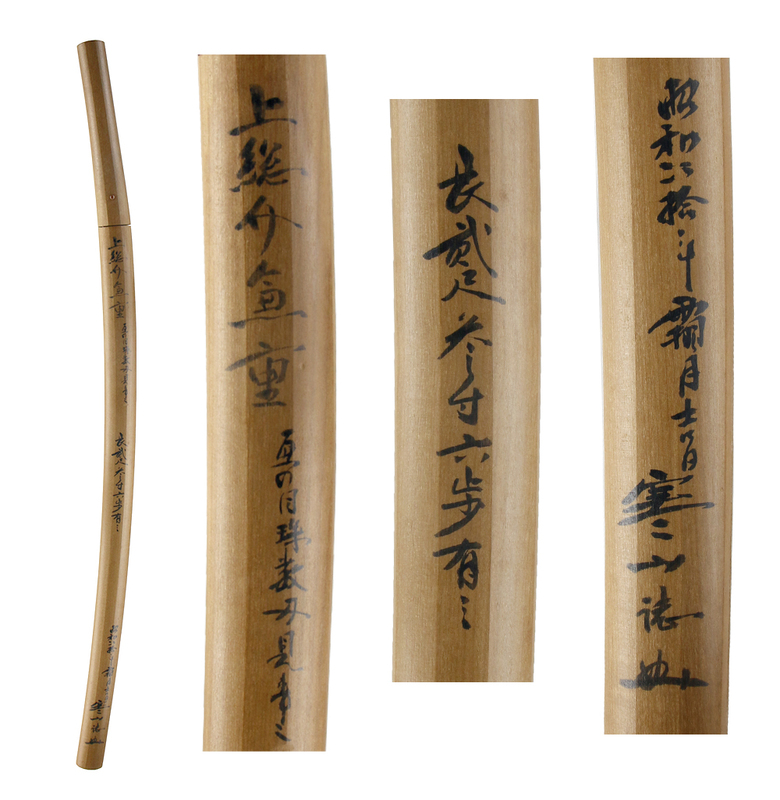 Shape : Wide and thick blade with large Sori. Jigane : Ko Itame Hada well grained with Jinie attach. Hamon : From Hamachi is Suguha and then Jyuzuba. The Nioikuchi is thick and rounded shape Gunome Midare with Ashi. Habuchi is soft and bright. Boshi is round Hakikake style. 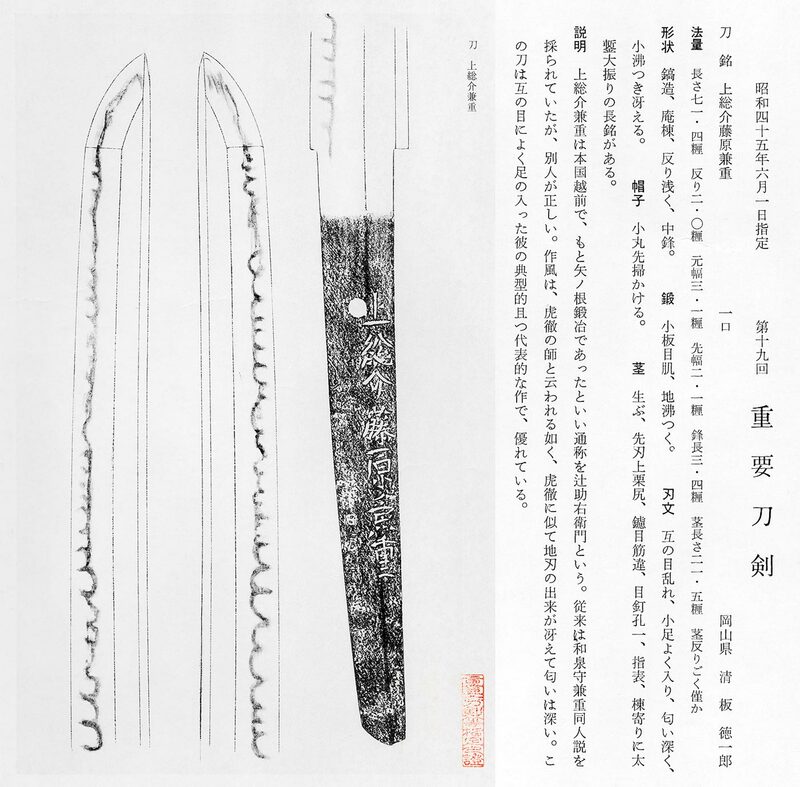 Special feature : Kaneshige was a swordsmith clan originated in Echizen province. present Mie pref. and passed away around 1658. This sword is second generation high reputation cut well sword. Many swords became Jyuyo token. 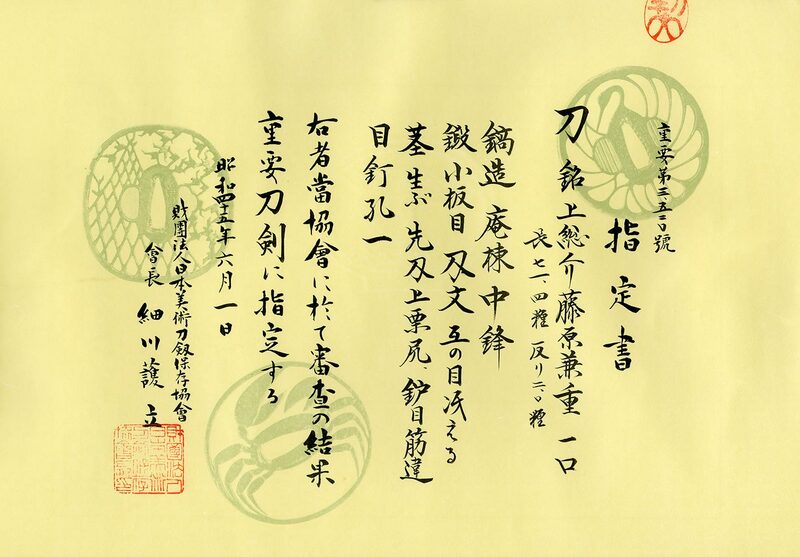 According to the story, Miyamoto musashi loved Kaneshige. From Aoi Art:　Kazusa kami Kaneshige made Jyuzuba which is very similar with Kotetsu hamon. This blade is almost same as Kotetsu style. The signature is engraved Reisy style so the blade was made early stage of his work. and made many swords cust well swords. Kaneshige 2syaku 4 sun 2 bu long sword as fis family’s treasure. Because Dodo family hired Kaneshige as family’s craft man. When Shinsengumi attacked Ikedaya, he arrived the first and used this sword for fighting. and achieved Teaching all skills to a disciple　and every time he attacked the first. Anyway Kaneshige is reported as high ranking sword and cut well sword either. We recommend this high ranking cut well sword for you.